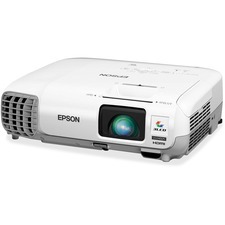 Portable projector displays native WUXGA with full HD 1080p support for bright, vivid images. 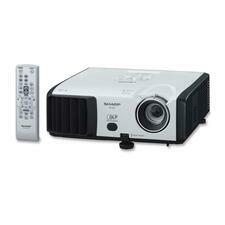 3LCD projector provides 4400 lumens of color brightness and 4400 lumens of white brightness for luminous, crisp clarity. Screen-fit technology automatically adjusts the size of the image to fit the screen. Split-screen functionality lets you display content from two inputs simultaneously, side by side, on a single screen. 1.6X optical zoom offers excellent positioning flexibility to fit large or small rooms. Mobile high-definition link (MHL) displays content from your MHL-enabled smartphones, tablets and Roku devices. EasyMP software helps you save energy, remotely access maintenance alerts and more. Multi-PC projection and moderator feature let you connect up to 50 Windows, Mac, iOS or Android devices at once. 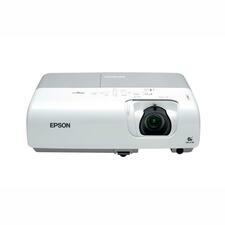 This wide-screen projector is the perfect tool for dynamic classroom lessons. 1280 x 800 resolution and 3000 lumens of brightness display bright, vivid images in high definition. Long-lasting lamp provides up to 10,000 hours in ECO Mode for a low total cost of ownership. Moderator device management software and network connectivity allow instructors to wirelessly share work simultaneously from multiple devices. 3LCD, 3-chip technology displays brilliant images with true-to-life colors. Built-in, 5-watt speaker amplifies the audio of your presentation to enhance lessons. 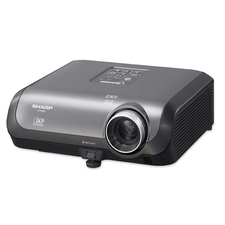 Projector also features HDMI connectivity for easy video and audio display with just one cable. The XJ-S35 is a high performance, super slim, portable, and compact projector that sets new standards with 2x wide-angle zoom lens. Choose any distance to the projection surface between 5.25 and 10.5 feet with optimum image quality in all cases. 2000 ANSI lumens mean you can project even in bright light. Sleek, lightweight project delivers built-in wireless projection and brilliant wide-screen performance in a slim, ultraportable design with 2600 lumens color brightness (color light output) and 2600 lumens white brightness (white light output). The PowerLite 1761W features native WXGA (1280 x 800) resolution - a must-have for delivering HD video content. Weighing just 3.7 lb. and just 1.7" tall, the PowerLite 1761W is ready to travel when you are. Take advantage of wireless 802.11 b/g/n LAN card capabilities and present wirelessly from your laptop, smartphone or tablet. Connecting is simple, on a Mac or PC, with USB Plug 'n Play instant setup. You can even use a USB memory device and deliver your presentation PC-free or connect via HDMI. Automatic vertical keystone correction makes setup even easier. The PowerLite 1761W is also equipped with a long-life lamp that lasts up to 4000 hours. 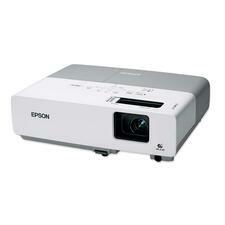 The Epson PowerLite 83c offers an easy, affordable way to bring brilliant presentations to any classroom or office. Closed captioning functionality is included, so this lightweight, full-featured performer has all the tools you need to accommodate the hearing-impaired. 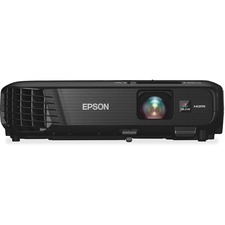 And with 2200 lumens and Epson 3LCD technology, it delivers bright, vibrant images to virtually any audience. 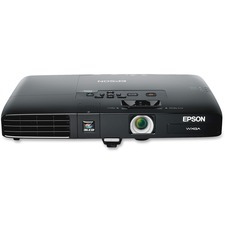 Notevision XR-32X Multimedia Projector offers high-resolution images with 2500 ANSI Lumens brightness, 2200:1 contrast ratio, XGA native resolution (1024 x 768) and compatibility up through UXGA (1600 x 1200). HDCP compliant DVI-D input for virtually noise-free images from digital sources. Features a DLP display technology, ultra-quiet cooling fans, DLP sealed system, filter-less lamp design, three-speed color wheel with sealed optics, and Condenser Lens Optical System. Ideal for extended-use operation. Lamp provides up to 4000 hours. Closed caption (CC1, CC2) features black text for easy readability. Presentation Assist Wireless Remote with Forward/Back PC and Mouse Control, Spotlight Function and On-Screen G.U.I. Pointer offers convenient remote control of all standard operations and presentation support. On-Screen Setup Guide and "Help" Function ensures easy set up and simplified operation. Quick Start for operation within approximately 3 seconds of power-on. 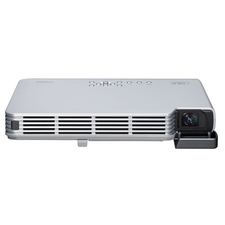 The Sharp Notevision Conference/Classroom PG-F310X MultiMedia Projector utilizes the latest Texas Instrument DLP BrilliantColor Technology for high brightness with outstanding picture performance. 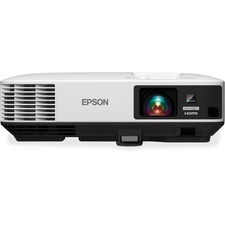 Portable projector displays high-resolution images that are perfect for presenting advanced, text-heavy charts and graphics. 3LCD, three-chip technology creates bright colors and a wide color gamut. 3,200 lumens of color brightness and white brightness display accurate and vivid colors even in well-lit rooms. Easy image alignment adjusts both vertically and horizontally to easily achieve a perfect rectangular image. HDMI connectivity provides HD quality with just one cable. Portable design is lightweight and easy to carry to quickly move from room to room. USB plug-and-play technology lets you instantly project images from a PC or Mac without any setup. Projector includes a power cable, VGA cable, USB cable, soft carrying case, remote control, batteries, user manual CD and quick setup sheet.